This comb features 8 razor sharp hardened steel serrated blades that can tackle unmanageable mats and tough tangles quickly and efficiently while maintaining coat length. √.With 8 teeth side for stubborn mats and tangles and the 11 teeth side for thinning to obtain a professionally groomed look. √.Stainless steel screw cap and comfortable grip handle, more stable and durable. √.Great for dogs, cats' hair grooming, can handle thick, curly, long, medium or short hair, all in one, super convenient! √.It especially addresses the issue of the undercoat, which can become a dense mess of loose, dead hair and the major source of shedding, prevent allergy. 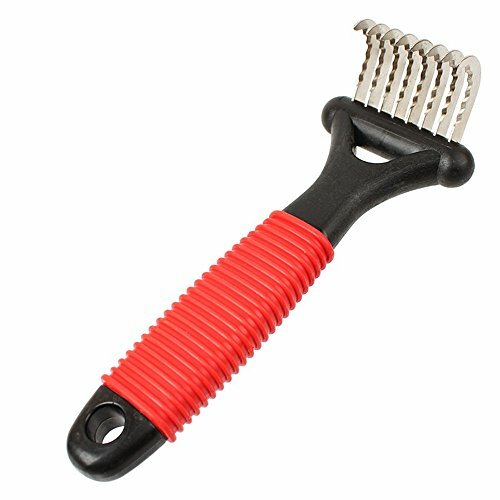 √.Massage rake to increasing blood circulation effectively, you pets will definitely enjoy the feeling that the tool provides. If you have any questions about this product by Plus Mi Life, contact us by completing and submitting the form below. If you are looking for a specif part number, please include it with your message.